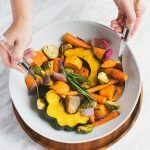 These easy roasted vegetables bring together all the delicious flavours of Fall into one dish! Sweet potatoes, carrots, acorn squash, Brussels sprouts, and red onion are slow-roasted until tender and slightly caramelized, making this a Thanksgiving side dish that is hard to ignore! Preheat oven to 425°F and line two large baking sheets with parchment paper. To a large bowl add prepared vegetables, oil, seasoning, salt and pepper. Using tongs, toss until all vegetables are evenly coated with oil. Add more oil if vegetables look dry or are not evenly coated. Divide vegetables between the two parchment-lined baking sheets ensuring they are spread out in an even layer. Roast in oven for 40-50 minutes, checking every 15-20 minutes, stirring/flipping vegetables as needed. Transfer vegetables to a serving dish and sprinkle with more salt or pepper if needed. Serve. Don’t have Wild Muskoka’s “White Pine & Rosemary Roasting Salt” on hand? Try using a blend of dried rosemary, thyme, sage and savoury instead!